The first album from Deep Purple's classic Mark II line-up, In Rock is a tight collection of seven confident tracks, anchored by the epic Child In Time. 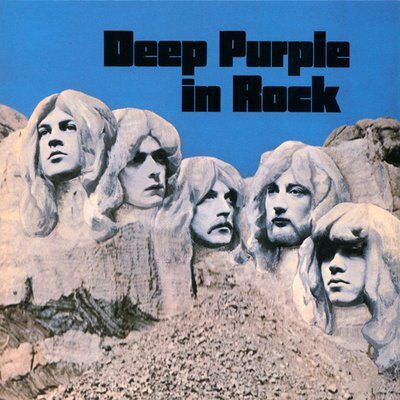 New members Roger Glover on bass and Ian Gillan on vocals round out the most talented version of the band. The soul of Deep Purple is established: Ritchie Blackmore's guitar wizardry, Jon Lord's classical-inspired keyboards, and Ian Gillan's nature-defying vocal range. They take turns sharing the spotlight on In Rock, and the three-pronged attack establishes Purple's unique sound. The band make good use of their signature style: simple chords extended to a song length thanks to high-energy solo work from Blackmore and Lord. Opener Speed King is a precursor to Highway Star, a celebration of all things fast, played equally fast, and with a more complex arrangement than most the rest of the material on the album. Flight Of The Rat is almost eight minutes in length, but the three minutes in the middle are what matter: Lord and Blackmore taking turns showboating and setting new standards in guitar / keyboard solo duels. The final minute is then given to Ian Paice to have fun with a short drum signature. Child In Time is one of Deep Purple's grandest tracks, with Lord's organ backing Gillan's soaring vocals for the slow opening three minutes, until Gillan's screaming becomes positively agonized, introducing the instrumental takeover with Blackmore's guitar running wild and producing one of metal's greatest early pure joy-of-shredding solos. The other four songs on In-Rock are steady without being spectacular, helping to create a rock solid foundation for the rest of the Mark II career. Engineered by Andy Knight, Martin Birch and Philip McDonald.